Metropolitan Energy Center and Grain Valley School District, in conjuction with the national nonprofit Propane Education & Research Council, hosted the “Autogas Answers for Schools Workshop” Friday at the Courtyard Marriott Kansas City East/Blue Springs. The workshop explained the advantages of running school bus fleets on propane autogas and showed Grain Valley’s propane-powered school bus fleet in action. 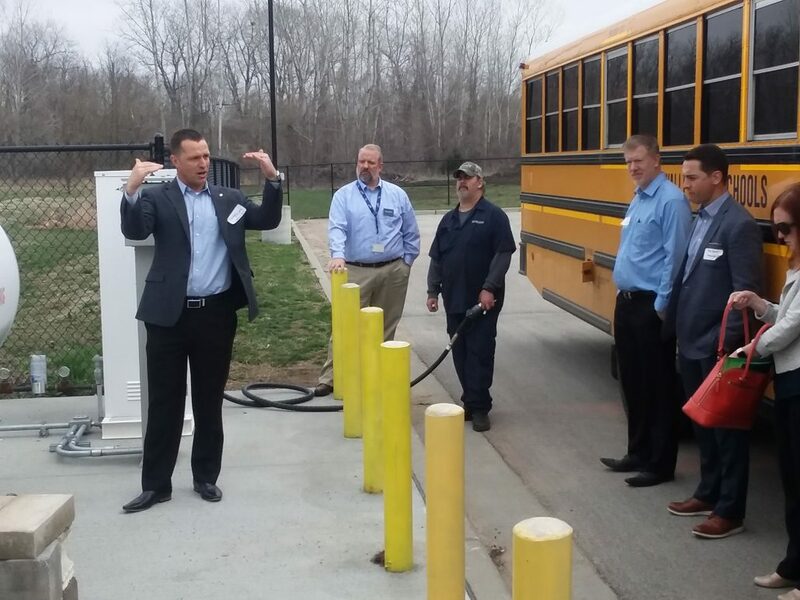 During the event, the Grain Valley School District provided a tour of their scalable propane autogas refueling infrastructure. As of January 2019, nearly 30 percent of Grain Valley’s fleet is powered by propane autogas. The Grain Valley Director of Transportation, Shawn Brady, plans to add seven more propane-powered buses by the end of the year. Propane professionals expanded upon Grain Valley’s testimonial by explaining how propane-powered school buses can reduce a fleet’s emissions and offer the lowest total cost-of-ownership of any fuel, in part because of lower fuel and maintenance costs. Attendees also learned about clean transportation funding opportunities and networked with clean fuel industry professionals. Nathan Ediger of Ferrelgas discusses propane infrastructure at Grain Valley SD. The Autogas Answers for Schools Workshop was put on by Grain Valley School District, Metropolitan Energy Center, Kansas City Regional Clean Cities, Propane Education & Research Council, Missouri Propane Gas Association, the Kansas City Area Association of Pupil Transportation, and Ferrellgas. For more information about Metropolitan Energy Center, visit metroenergy.org. About Metropolitan Energy Center: Metropolitan Energy Center is a non-profit and a catalyst for energy efficiency, economic development and environmental vitality in America’s Heartland. It is host of Kansas City Regional Clean Cities, a designated U.S. Department of Energy program, and Central Kansas Clean Cities. Learn more about us and our programs at metroenergy.org.